FATAL PORTRAIT is a metal band formed in 1998 in Santander, Northern Spain, by ex-members of the bands Mordor and Finis Africae. Until now the band has recorded a 7" limited to 666 copies called "Rapture among the idols" and a full lenght CD called "An elusive instinct...of lascivia" both with independent Swedish labels: Arte de Occulta and Downfall Records respectively also appearing on compilation CD's in various countries helping the band to become known in the underground metal scene. 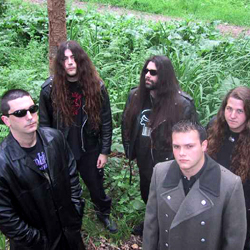 "An elusive..." was mixed at "Sonido XXI" studios and has received great reviews from renowned magazines like METAL HAMMER, HELL AWAITS, KERRANG, ROCK HARD, TERRORIZER among others as well as giving interviews to lots of webzines and receiving good feedback from fans and critics not only in Europe but from America and Australia as well. In all this time FATAL PORTRAIT has played many concerts in various Spanish cities and also in the "Steel Warriors Attack" festival in Barroselas, Portugal sharing bill with the most important Spanish bands like ASGAROTH, AVULSED and THE HERETIC, as well as internationally known acts such as YATTERING, KHRABATOR, EXMORTEM, NECROPHAGIA. They have also been finalists in the renowned European contest VILLA DE BILBAO in the metal category. At the end of 2001 the bass player and one guitar player decided to leave the band due to job reasons but were quickly replaced by Edu on bass (with their previous band, Endemic, has opened for Spanish Heavy Metallers TIERRA SANTA) and Juan Pablo on guitar (coming from the Mexican band Calvaria, this band has shared stage with bands like GAMMARAY, RHAPSODY, SHAMAN and ANGRA) completing the original line-up with original members Oscar (vocals), Fernando (guitar) and Sergio (drums). With a complete line-up again the band started to compose and after recording some demos they decided to produce their new album which was mixed and mastered by a renowned Spanish Producer called CARLOS CREATOR. There has been a natural evolution in the sound of the band thanks in part by the wide influences brought in by the two new members but also due to their will to achieve a personal sound which they have truly achieved mixing agressive and melodic parts and combinig different types of voices resulting in a very unique sound. New album "Adventum" recorded in 2005 and released by More Hate Productions.